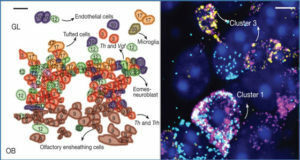 Gene expression heterogeneity in the pluripotent state of mouse embryonic stem cells (mESCs) has been increasingly well-characterized. In contrast, exit from pluripotency and lineage commitment have not been studied systematically at the single-cell level. Here a team led by researchers at the Hubrecht Institute measured the gene expression dynamics of retinoic acid driven mESC differentiation using an unbiased single-cell transcriptomics approach. The team found that the exit from pluripotency marks the start of a lineage bifurcation as well as a transient phase of susceptibility to lineage specifying signals. This study revealed several transcriptional signatures of this phase, including a sharp increase of gene expression variability. 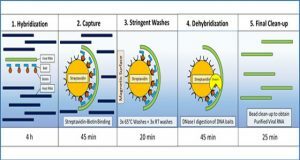 Importantly, the researchers observed a handover between two classes of transcription factors. The early-expressed class has potential roles in lineage biasing, the late-expressed class in lineage commitment. 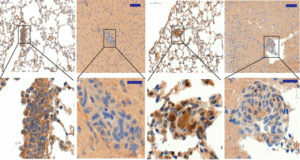 a, Scheme of the differentiation protocol with phase contrast images of cells growing in 2i medium (0 h) and after 96 h of exposure to 0.25 μM RA in N2B27 medium. 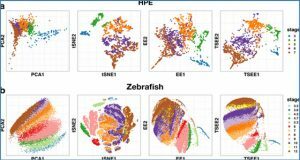 b, t-­SNE mapping of single-­cell expression profiles. 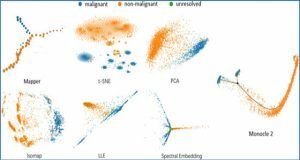 The single-­cell RNA-­seq data (SCRB-­seq) for all cells and time points were mapped on a one-­dimensional t-­SNE space, which preserved local similarity between expression profiles, while reducing dimensionality. 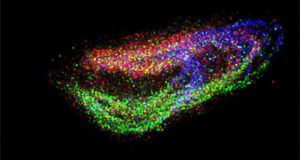 Each data point corresponds to a single cell. Data points for individual time points are shown in violin plots to reflect relative frequency along the t-­ SNE axis. The color of each data point indicates rex1 expression (relative to maximum expression across all cells). For the 96 h time point, two robust clusters (found by k-­means clustering and stability analysis) are indicated with red or blue edges, respectively. c, Single-­cell gene expression variability quantified as the variance relative to the mean (Fano factor). The Fano factor of individual genes was averaged over all significantly variable genes. 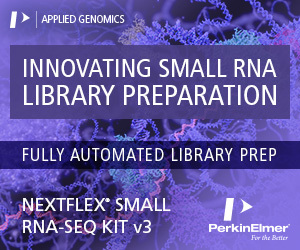 Expression was measured with SCRB-­seq. Dashed lines indicate the average Fano factor calculated using only cells in one of the two clusters, or cell types after 96 h of RA exposure (see b). In summary, the research team provides a comprehensive analysis of lineage commitment at the single cell level, a potential stepping stone to improved lineage control through timing of differentiation cues.